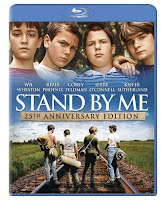 2011 marks the 25th anniversary of my favorite movie, Stand By Me. If people know me at all, they know that Stand By Me means a lot to me. A lot of people have favorite movies. 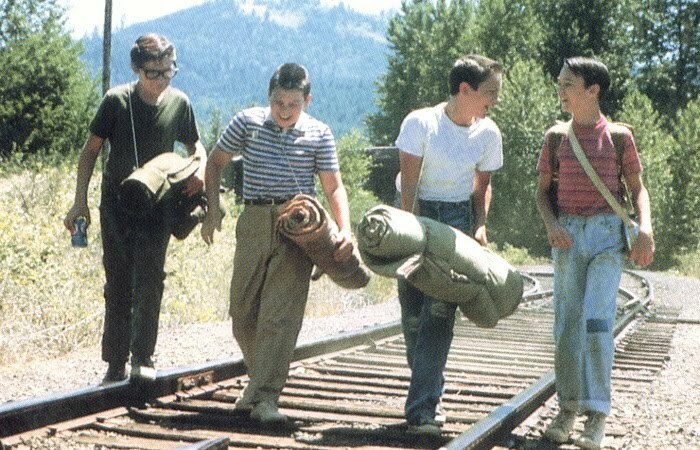 For me, Stand By Me is more than just a movie I could watch over and over again. I have vivid memories of my history with this movie and what it means to me today. I remember when I was about eleven or twelve, I would catch it on Fox Channel 29 on random Saturday afternoons. I thought it was funny, endearing, and full of heart. The boys in the movie were twelve going on thirteen, so I felt like I could really relate to them. They were outcasts at school and relied on each other to get through the rough times of their adolescent years. It was rated R, but since it was on regular TV I knew that they didn’t show of any of the “bad stuff”. I later convinced my step dad to let me buy it at Suncoast Video even though it was Rated R. I convinced him that it was only Rated R for bad language. Rob Reiner directs based on a short story by Stephen King. Yes, that Stephen King. The year is 1959 and the town of Castle Rock is in search for the location of a missing boy named Ray Brower. While digging under his porch for his penny collection, Vern(Jerry O’Connell) over hears his brother telling a friend where the body might be. Vern think it would be fun if he tells his friends about the body so they can find it first. 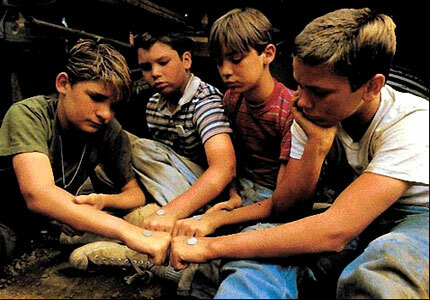 Vern runs to the tree house to find Chris (River Phoenix), Gordie (Wil Wheaton), and Teddy (Corey Feldman) playing cards. After Vern tells them about the body, they make a deal to set out and find the body and be heroes. They decide it’s worth the trouble they’ll get in from their parents. 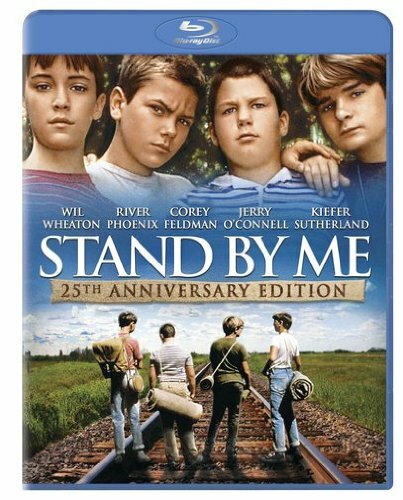 Throughout the movie, the boys almost get run over by a train, get chased by a junkyard dog, get covered in leeches, and get into a fight with the older brothers. Throughout their funny adventure the movie also has it’s serious tones as well. You see each boy’s vulnerable sides as they deal with their own pressures of family and school expectations. Gordie is practically ignored by his family due to the death of his older brother. Chris is considered a rebel and bad influence as he stole some money from school. Teddy’s dad almost burned his ear off. Vern is overweight and not the brightest kid in class. They only have each other for support and guidance when they don’t know where else to turn. There are two wonderful scenes between Chris and Gordie when they provide a shoulder to cry on over disappointments in their life. Friendships have always had a huge impact on my life. I’ve had various friends come and go throughout life. We all go down various paths in life. 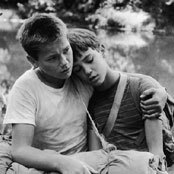 Whenever I think of Stand By Me, I think of my friend Dillon. He’s been my best friend since I was fourteen. We’ve been through quite a bit together, and he’s still put up with my throughout these years. When I moved this post over to this website from my previous blog, I felt I should update with another story about why this movie means the world to me. Every year, I celebrate my birthday by going to a movie. I know that’s a huge surprise to everyone out there. On January 2, 2013 my husband and I were headed to the movie when he started to veer off our standard route to where I thought we were going. Much to my surprise we ended up at the Heights Theater in Columbia Heights, MN. There on the marquee it says, “Happy Birthday, Paul”. I grew up going to the Heights and thought it was a sweet gesture to have my name on the marquee of that vintage art house theater. I would never have guessed what was waiting inside the theater. I step inside with utter shock as thirty friends and family have joined in on this 30th birthday surprise. My husband rented out the theater for all of us for a private screening of Stand By Me. There we sat in the middle of the afternoon with the theater all to ourselves watching my favorite movie. I was speechless. I felt so honored and humbled that these truly amazing people in my life took time off their day and leave work for this very special day. It was the first time I had seen it on the big screen and I found myself laughing and crying as if I was watching it all for the first time. It was one of those days that I will never forget.